The college of the future. Launch of NewVIc 2020 at The ArcelorMittal Orbit, Stratford. This is both a celebration and a launch. A celebration of what NewVIc has achieved since it opened 24 years ago and also the launch of our vision for the NewVIc of 2020. We have curated an evening of art, music, song and dance, produced and performed by current and former students and we are delighted to welcome Flux @flux_official as our headline act. Flux are nearly all NewVIc alumni, including Shammi Pithia and Michael Goodey. They have developed a beautiful ethereal fusion style and perform widely internationally, appealing a growing global audience. We are also very grateful to ArcelorMittal and Ian Louden, their global branding director, for the opportunity to use this amazing venue. Just as this viewing platform offers a 360° view of London, we want to take a 360o view of the college’s world, it’s past, present, and future: taking account of the current challenges we face and the opportunities all around us. Next time we have a party will be in September when we will be opening our wonderful new building in Plaistow and will have nearly as spectacular a view of Canary Wharf and the City. 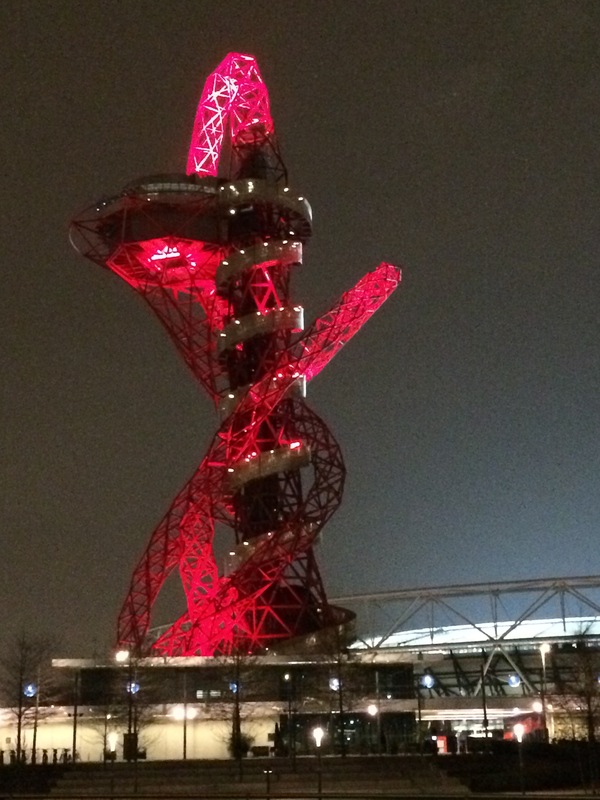 We chose Anish Kapoor’s Orbit for several reasons. First, we identify with its scale, ambition and with its contribution to the legacy of transformation in East London. Also, like its cousins, Eiffel’s tower in Paris and Tatlin’s design for a Monument to the Third International, it seems to point to the future, to be ready to launch us into orbit, to propel us towards a better place. We send more students from disadvantaged backgrounds to university than any other sixth form in England. We sent 770 students to university last year, 91% of applicants – well above the national average for both A level and vocational students. We sent 90 students to Russell group universities, our highest number ever, a number which has more than doubled over the last 5 years. Our vocational results are above the national average. We remain proudly comprehensive, with students at all levels from Entry to Advanced. Our core values haven’t changed, in fact they have been remarkably constant through the last quarter century – partly perhaps because of staff stability and continuity and the fact that the college has only had one change of principal in that period. After much discussion and consultation we have added to our existing mission; to create a successful learning community, with three further principles: ambition, challenge and equality. We want to offer the best opportunities for learning and progression and to be an indispensable partner for local schools, universities and employers providing the greatest possible challenge, the highest possible standards and the widest possible progression for everyone, whatever their starting point. We are a good college but our ambition is now to become an outstanding college. 2016 is turning out to be an important year. We’re going to be taking some big decisions. The London mayoral and GLA elections in May will determine the direction of travel for our city and the referendum on European Union membership in June will be critical for our country’s future. In post-16 education, all the colleges in England are being asked to consider their future role and many are already making major changes. In common with all Sixth Form Colleges, NewVIc is being asked to consider converting to 16-19 academy status, joining the school sector and forming new kinds of educational partnerships. My view is that we have to join the mainstream and make the shift from independence to interdependence. So as we go into this period of change it’s a good time to ask ourselves: what will the successful education providers of 2020 look like? Will they be the ones working in splendid isolation, holding on to every scrap of autonomy they have, competing with everyone around them and trying to do everything? Or will they be the ones which have pooled some of their autonomy, grasped the opportunity for deeper collaboration to share good practice, learn from others and to look at the whole learner and the whole learning journey, at least from 11 to 21, if not from 5 to 95? We all have our different strengths and none of us are expert at everything, so I think we must work more closely with new partners including schools, universities and employers. Our vision is that by 2020, NewVIc will be part of a successful, comprehensive local education system which will be providing even better opportunities for young people. Your presence here this evening is important to us and is proof of your commitment to improving the life chances of young people in East London. As organisations, if you choose to work with NewVIc you will be working with confident, talented and resourceful students and staff with the passion and commitment to really make a difference across all areas of human endeavour, in the arts, sciences, humanities, law, sports, business, engineering, healthcare… you name it. As individuals, if you want to do more, we would like to ask you to consider giving us 360 minutes of your time in 2016 – to lend your knowledge, skills and expertise to inspire, support and nurture students at NewVIc as they navigate progression to higher education and the world of work. You and your colleagues can make a real difference, even in just 6 hours and we value your contribution to supporting and enriching our students’ educational experiences. You can help make this happen. You can help us propel young people into their professional lives and give them the escape velocity to launch them into orbit. We look forward to being in orbit with you. This entry was posted in Education, Education Futures, NewVIc and tagged Anish Kapoor, Arcelor Mittal Orbit, comprehensive education, Education, Eiffel tower, elections, Equality, London, Newham, Newham Sixth Form College, NewVIc, NewVIc 2020, NewVIc alumni, Sixth form college, Tatlin tower, university progression, vocational education, young people. Bookmark the permalink.